I’ve been traveling recently. Taking lots of photos. But not having much time to post. Hopefully I can free up a block of time now. We’ve been doing a cruise of the Greek Islands (with a stop in Athens) and I will post some of those shots soon. But let’s start with where I am right now, Rome. I’ve been to Italy before but wasn’t as prepared for the experience then and didn’t have much time. Now I have a week in Rome and my best discovery has been the churches. Obviously Rome has more than it’s share of churches. 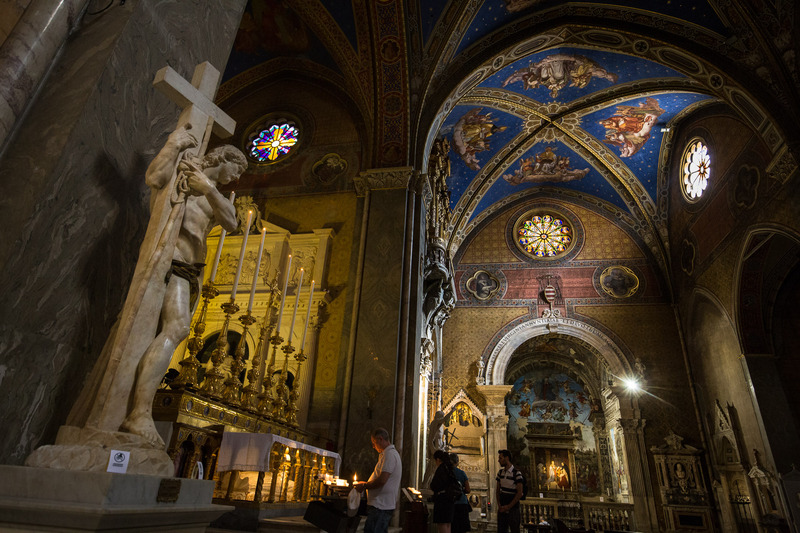 Most travelers will hit the Vatican and swing by the Sistine Chapel and St Peters. But to me, that’s just scratching the surface. 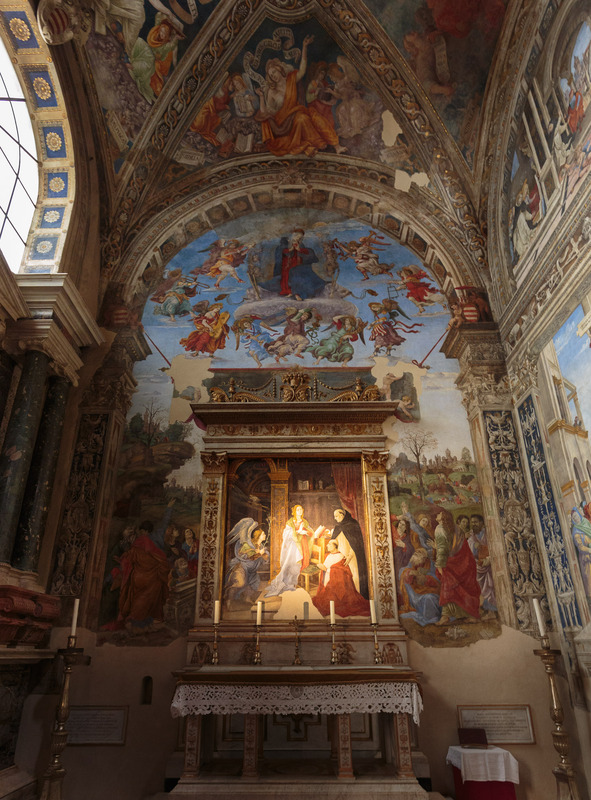 Savvy travelers know that some of the best travel experiences come when you wander into a church you’ve never heard of and discover impressive works of art and a place for reflection. 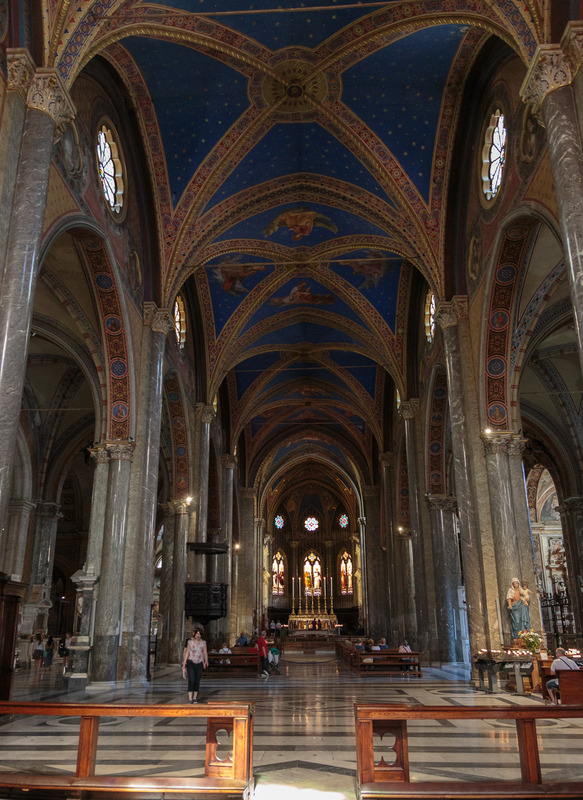 But on this trip to Italy I’ve decided to go one step further, researching holy sites that would appeal to my artistic and spiritual interests. I did some reading and looked online for images of churches that seemed special in some way. Here’s the first of my favorites. 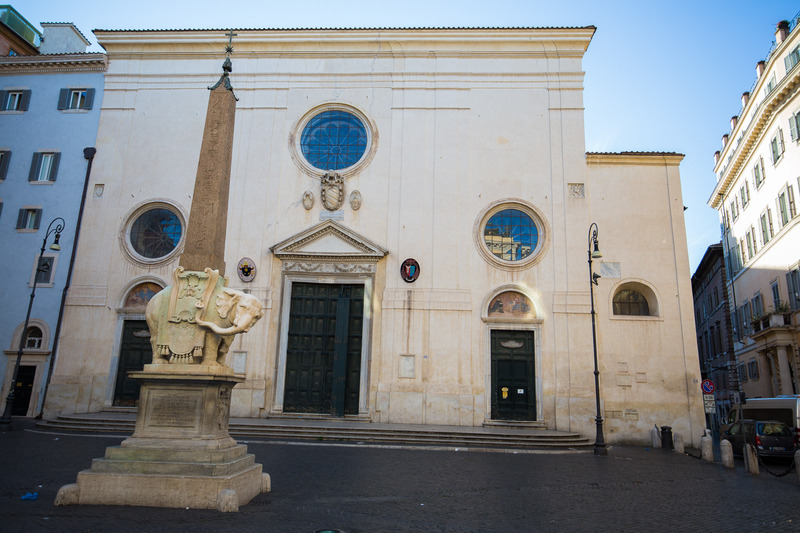 Santa Maria sopra Minerva (let’s just call it Minerva) is one short block south of the Pantheon and just a few blocks east of Piazza Navona. It got it’s name because the site was the site of a temple to Minerva in Roman times. The first church was built on the site in the 8th Century. It was totally rebuilt in the 1200s. You can see that in the general layout of the place, a long central area and not much in the way of side chapels — special alcoves are an architectural element that gets more developed in later churches. The interior got a major renovation in the Baroque era. So like lots of other Roman churches, Minerva is a living history. And if you look closely you can see how these ancient sites are reimagined every few hundred years. The exterior of the church is fairly simple. It’s a cream-white that has a Bernini sculpture you can’t miss, an elephant with an Egyptian obelisk on its back. Quite cool. The entrance faces west. Step inside and once you get used to the light, you notice how long the church is. The ceiling isn’t like many Baroque churches, no dome, no trompe l’oeil ceiling painting. Instead you have this deep blue firmament trimmed in gold. The alter area is fairly simple as well. 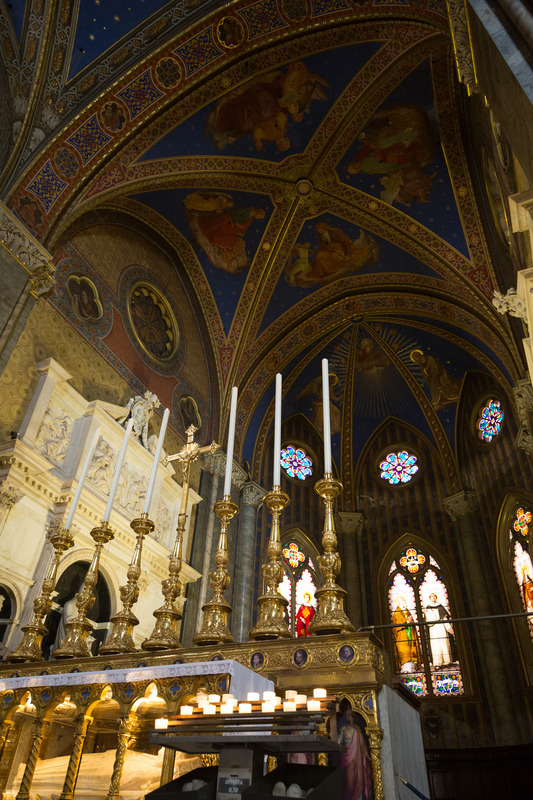 But behind it are some tasteful stained glass windows and the blue ceiling gets more elaborate frescos here. I shot this using the candles as foreground elements against the stained glass and blue ceiling. 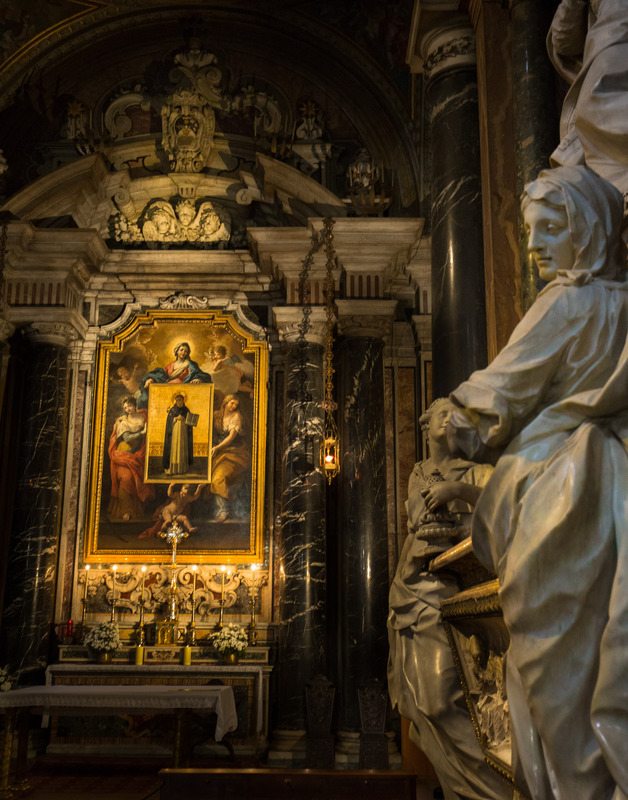 To the left of the alter area is a statue of Christ, thoughtful as he stands there holding a small cross. The statue is by Michelangelo. Not one of his major works but beautiful. I generally avoid shooting art works on their own as you’d do in an art catalogue. That’s a popular approach with first time photographers. But I find that just capturing a photo of a sculpture or painting can lead to a static approach that tends to bore the viewer. So I shot this one from the side and pulled in the southern section of the church as my background element. From this vantage, you can see an alcove. 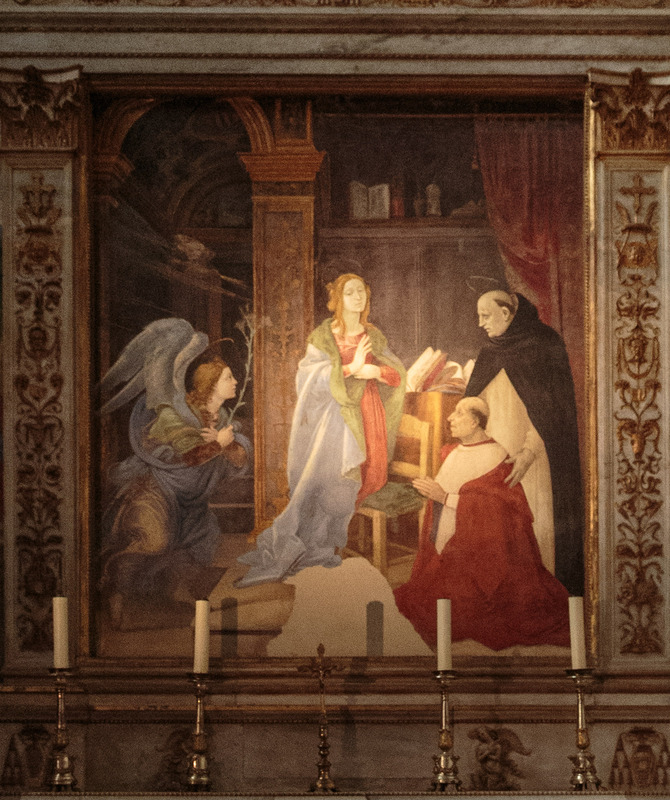 It holds a painting by the great Medieval artist, Fra’ Filippo Lippi. Lippi is pre-Rennasaince so you don’t get a true perspective. But his work has a purity and sense of wonder that transcends the era. The alcove on the other side has no art by anyone particularly famous. But I liked the way the entrance sculpture and the painting played off each other. Minerva is worth a stop if you’re visiting Rome. Gorgeous church and wonderful photos. This church differs very much from those we have in Finland. In Finland we have huge amount of wooden churches full of wonders!